On April 26 (2015) I completed my 12th marathon (2) by running the Marathon of Madrid, 15 years after having completed the first in the same place. My friend Jose and my brother Jaime completed there their 1oth marathon. We have run together several marathons: Paris, Berlin, Rome, Athens, Rotterdam, New York, Sevilla… the fact is that we have not run any of those together from the start to the end (3). For these reasons we had decided in the previous days that this time, we would run it together from the beginning to the end, no matter what happened. After the bad experience in Sevilla, I had found it difficult to find the motivation to train. However, a couple of weeks after Sevilla, I beat my personal best in half marathon and managed to complete a good mileage prior to Madrid. I thus felt that I arrived to Madrid in a good shape. On the other hand, Madrid hasn’t got the best profile to attempt a personal best. Thus, we decided to take it rather easy. Our quick strategy was something like: run at about 5’20″/km the first climb (7km) then run 5′ till the half marathon, close to that pace till the entrance of the Casa de Campo (~26km), take it easy there, exit it and do the final 6km climb as we can… thinking we could finish in about 3h45′ doing that. … and that is what we did. Give or take some seconds to the paces, and softening a bit more in the second half. Our final net time was about 4h02′, but you would have to discount about 9′ to have the time we were actually running as we had a rather long pit stop at km. 13. Discount those minutes and we would have been at some 3h53′, just a few minutes above the target. My brother Jaime wrote a very detailed post here about how the race developed. I suggest you to read it. Big time in this finish line. Posing after receiving our deserved medals. (1) In a previous post, “Running in the Incles’ valley“, I described the joy of running alone in the mountains. I then compared it with what the experiences of Christopher McCandless, the man about whom the story of the movie “Into the wild” is based. I quote here one of his latest sentences. 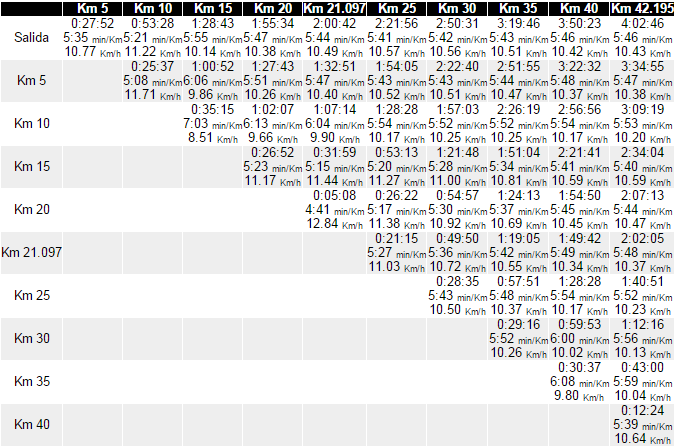 (2) Not counting Millau in 2011 (100km) nor Sevilla 2015 (not completed). (3) I completed Millau together with Jose in 2011, and I have completed several San Silvestre with Jaime.